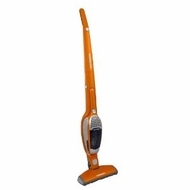 Electrolux 2-in-1 stick vacuum cleans bare floors, countertops and upholstery. This versatile cordless model is always ready to clean with a crevice tool and dusting brush stored on the charging stand. Clean around and under anything with the 180-degree swivel head. Brush roll is designed for bare floor and area rug cleaning. Powerful cyclonic suction technology maintains suction power longer with an easier to clean filter system.